We'll learn to make a sandbox project on Drupal.org. A sandbox project is a module or theme that contains experimental code that is not yet ready for general use. Full projects are for general use. 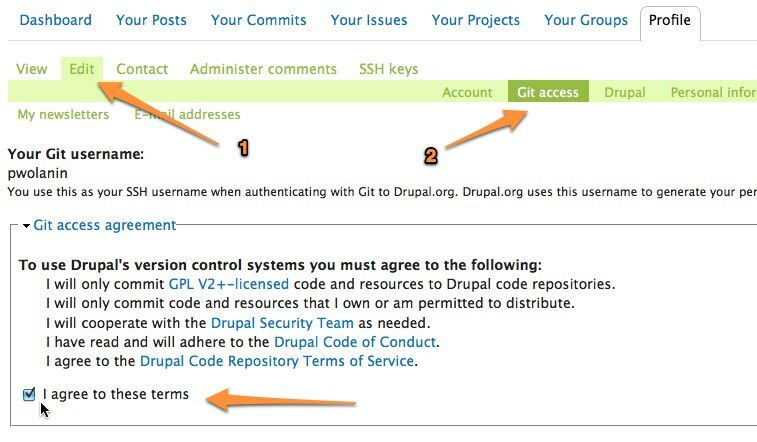 We first need Git access on drupal.org to create a sandbox project. 1) Navigate to your user profile and click the Edit tab > Git access sub-tab. 2) Now specify your Git username in Desired Git username field. 4) Upon completing this form, Git user configuration information appears on the page. Use those commands in your git bash. Confirm the information using 'git config -l' command. 1) Go to 'Add new project' page. 2) Click on Module project to make a sandbox module. 3) Fill in the information about your project. Now click on Save. 4) You would now be redirected to your project page. 5) Click the Version control tab near the top of the new project page for instructions on how to start committing code to your sandbox repository. The project will appear in the My Projects page in your dashboard.